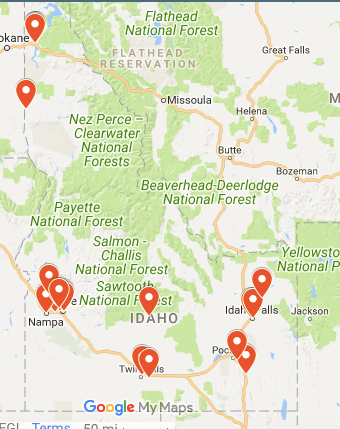 Idaho Ed News: Map Where Idaho's National Merit Scholars are From - "Thirty-four Idaho high school seniors are among 7,000 students from across the nation who’ve received a prestigious National Merit scholarship." EdWeek: Map: Per-Pupil Spending, State-by-State - The publication mapped data from the Quality Counts 2018 report. The U.S. average was $12,562. Wicked Local Burlington (MA): Interactive: Check out this map of the college destinations for Burlington's Class of 2018 - "BHS alumni will be dispersed from Canada to Carolina representing the school with pride as they continue their education." You may want to compare the map to the one for Newton North, in Newton, MA. Why were these maps made? I think it's because they could be made. Esri Campus Maps Program: Penn State is the newest campus addition to the ArcGIS Online basemaps! You can also view updates for Michigan State University and University of New Hampshire. Via my colleague Shane Mathews. National Geographic: Education Grants - "Education-focused grants aim to help educators teach people about the world and how it works, empowering them to make it a better place. Projects may introduce innovative instructional strategies for students of any age and in any location. Other projects may take proven ideas and scale or replicate them for larger audiences or different geographical areas. Projects may also measure what is working in education and add to the body of knowledge about how people learn." There are opportunities to apply for a few thousand up to $30,000. 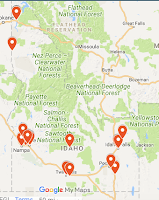 I'm curious where I'd find the details of this study mentioned in the discussion of the grants: "Using a Giant Map of Montana to help students in a Crow Indian Reservation school relate geography to their culture." I'm still need to be convinced of the educational value of giant maps. I know they are fun, but I'm not yet convinced they are valuable teaching tools. Esri Education Blog: Fun with GIS 234: 2018 HS+MS Competition Results - "In 2018, 28 states participated. In the 22 states receiving entries, 126 came from 46 high schools, and 180 entries came from 41 middle schools. Of the 306 total submissions nationally, a third happened in just one state -- Minnesota." Esri Education Blog: 2019 ArcGIS Online Competition for US HS+MS Students - "From across the nation, one HS project and one MS project will each earn a trip to the 2019 Esri Education Conference in San Diego, CA, during Esri's 50th year celebration." THE Journal: Competition Calls for AI-Created Minecraft Settlements - "A competition hosted by the NYU Tandon School of Engineering is challenging humans to create algorithms for producing adaptive settlements in Minecraft." Submissions are due June 30. Press release: Fisheries and Oceans Canada and Dalhousie University launch interactive map to help protect North Atlantic right whales - The map, developed by Hansen Johnson, a PhD student in Oceanography at Dalhousie University, provides information on recent right whale detections and and various surveillance efforts and protection measures. TAMU: Thanks To Aggie GIS Partnership, Esri Experts Provide Free Courses At Texas A&M - Geri Miller and Canserina Kurnia, solutions engineers on Esri's education outreach team (my team), taught for two days at Texas A&M, an Esri Education Development Center. The Dispatch: South Davidson graduate eyes future in scientific research - South Davidson High School senior Claire Patrick will attend the University of North Carolina at Charlotte in the fall. She said that she wants to "study geography with a concentration in geographic information science and technology and hopefully get her doctorate in geospatial analytics." Lewiston Tribune: Kalispell students learn mapping through augmented reality - "[Science teacher Jaret] Stump said the sandbox teaches topography and how to read 2-D topographic maps." EdSurge: Roombas, Refrigerators and Other Unexpected Tech That Teachers Actually Ask For - A data analysis of DonorsChoose.org, where individuals can donate to fund teacher's requests, reveals that teachers want technology other than computers, tablets and software. Press release: Hexagon Geospatial partners with Brilliant Remote Sensing Labs for imparting free online training - Hexagon Geospatial partnered with Brilliant Remote Sensing Labs to provide students with free, up-to-date licenses of ERDAS IMAGINE for online training. Brilliant Remote Sensing Labs, based in the UAE, offers an online educational program in English and Arabic that covers remote sensing and satellite image processing via its Remote Sensing Portal. The site still indicates that students must purchase the software: "- Courses no 3 to 16 require having an ERDAS Imagine software, knowing that course no 13 requires having ERDAS Imagine VGIS module. – If you need assistance with purchasing ERDAS Imagine license, please contact us. Knowing that you can purchase it at a low cost for the course period only instead of purchasing a full license." The Functional Art Blog: New MOOC(s) - Alberto Cairo writes: "This year I'm doing two separate Massive Open Online Courses, one in English, which begins in June —registration is already open, so sign up— and another one in Spanish (more information soon; this one will likely be around October.) In these free courses I cover the basics of data visualization and teach a few tools I love, such as INZight and Flourish. I have some tutorials about them here, as you may remember, in case you're interested. In the course I assume you have no knowledge of visualization, so recommend it to friends and acquaintances who you know want or need to learn it."